The play "Paradise" ran at the Lyric theatre Belfast from June 4th to July 4th 2004 and is based on the book "Paradise Lost and Found" by Padraig Coyle. 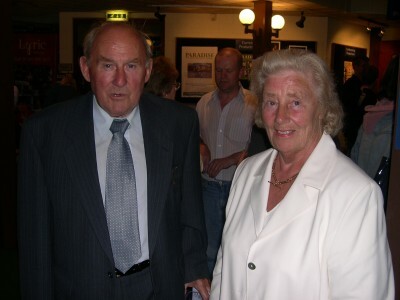 Charlie Tully and Elisha Scott, two figures from contrasting political and cultural backgrounds, come together through their association with the great name of Belfast Celtic Football Club. "Paradise" was the home of Belfast Celtic and a name cherished by many supporters. When Paradise was lost, the terraces lived on in the memories of those left behind and for generations beyond..
Against a backdrop of civil and political division and social deprivation, this play, set in 1952, revives the enduring spirit of one of the most successful clubs in football history. Music, humour, drama and song celebrate a true sporting phenomenon. The play received great reviews in the local media, national media and the English press. A fantastic nite which will be remembered by all as a great tribute to the Grand Old Team. 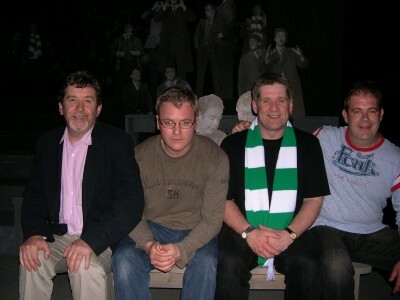 Sections of the play were recreated for a new audience at the Errigle Inn in Belfast in November 2005. Plans are in place for bringing the production to a wider audience in the course of the year 2006.